Rival-powered Lion Slots Casino is earning rave reviews throughout the online gambling community, and for good reason. The combination of Lion Slots Casino's advanced graphics and sound, as well as its massive selection of games has propelled this casino to be mentioned among the industry's elite. Players can choose from over 100 casino games, each presented in Rival Casino software. While Lion Slots Casino offers tremendous table, card and video poker games, its slots games are nothing short of spectacular. The casino doesn't only offer "video" slots, it offers animated, interactive machines known as i-Slots. New players at Lion Slots Casino will be the recipients of $500 in free casino bonus money. On your first deposit, the casino gives you a 100$ match bonus, up to $100 free. On your second deposit, the casino offers a 150% match bonus, up to $150 free. Finally, on your third deposit, the casino will credit you with a 250% match bonus, up to $250 free. Essentially, you'll earn $500 free for depositing $300. In addition, if you're not sure that Lion Slots Casino is right for you, test drive it before making a deposit - you can make money without spending money! 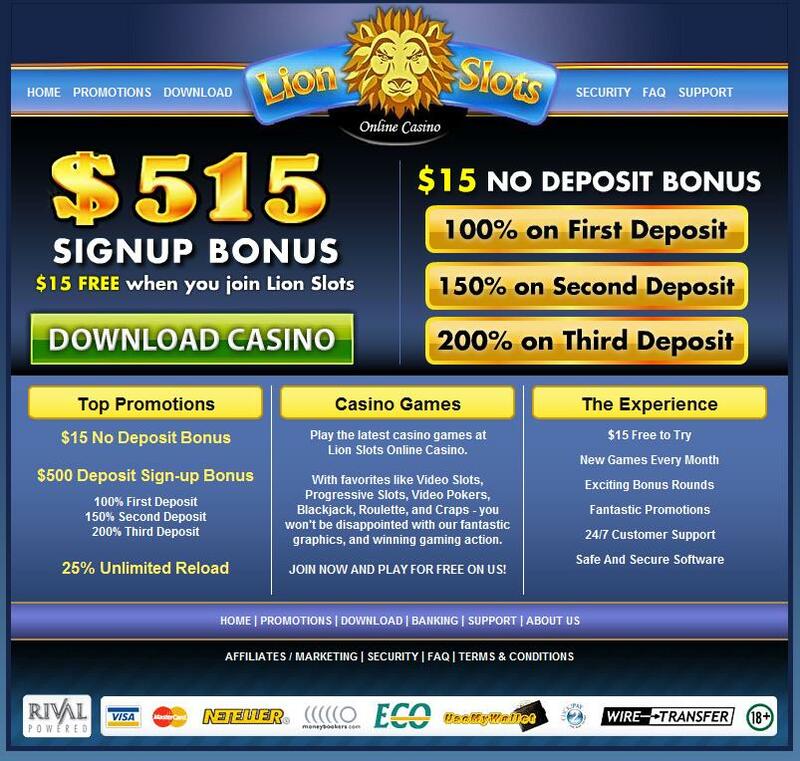 That's right - Lion Slots Casino gives all new sign ups $15 free to play with at the casino - no strings attached. So if you'd like to try out Lion Slots Casino's games and even have a shot at making some money, visit the Lion Slots Casino Web Site right now! Lion Slots Casino features over 100 Rival Casino software games, including a wide variety of table games, video poker and slot machines. Lion Slots Casino's table games include: Blackjack (several variations), Baccarat, Craps, Roulette, Caribbean Stud Poker, Three Card Poker and Let It Ride Poker; video poker titles include Jacks or Better, Double Joker, Deuces Wild, and Aces and Faces. If you're into slots, Lion Slots has you covered with titles like Gold Rush, Flea Market, Chicken Little, Travel Bug and Surf Paradise. The slots fun doesn't end there though, as Lion Slots Casino features Rival's full lineup of i-Slots, including Rock On, Hole in Won, Cosmic Quest, As The Reels Turn, and the rest of the collection. i-Slots can be best described as the fusion of classic video slots and video games, as they bring you closer to the slot machine than ever before. An i-Slots player gets to unravel a storyline as the game is played, and is treated to video clips, mini-games and more. Lion Slots Casino encourages players from all over the world to sign up, including those from the US. Download Lion Slots Casino software for free to get in on all of the action!